Viva España! But this is not España? That well-known, and more than once used by me, saying ‘traveling broadens the mind’ is just so true that I cannot but use it over and over again. I love it so much when paradigms are shifted, and so much more when it’s my own. What I thought will be a two-week visit to Spain turned out to become a two-week visit to a few of the ‘Spains’, consisting of Aragôn, the Basque country, Navarra and La Rioja, Cantabria, Asturias and Catalonia and no Spain at all! Thus, I will somewhere in the future have to spend time in Spain. One simply cannot fit so much to see, so much history, conflict, culture, restaurants, roads, art, architecture, photographic potential, beaches and people into two weeks. However, let me start at the proper beginning. To do a road-trip, one has to be equipped well, and I have learnt on this trip that the most essential piece of travel equipment to ensure a successful road-trip is an integrated iPod system, though if you allow the wrong family members to influence the playlists too much, you will end-up ‘clubbing’ down the highways in the early hours of the morning in tune with the Pitbulls, Iglesias’ and alike. 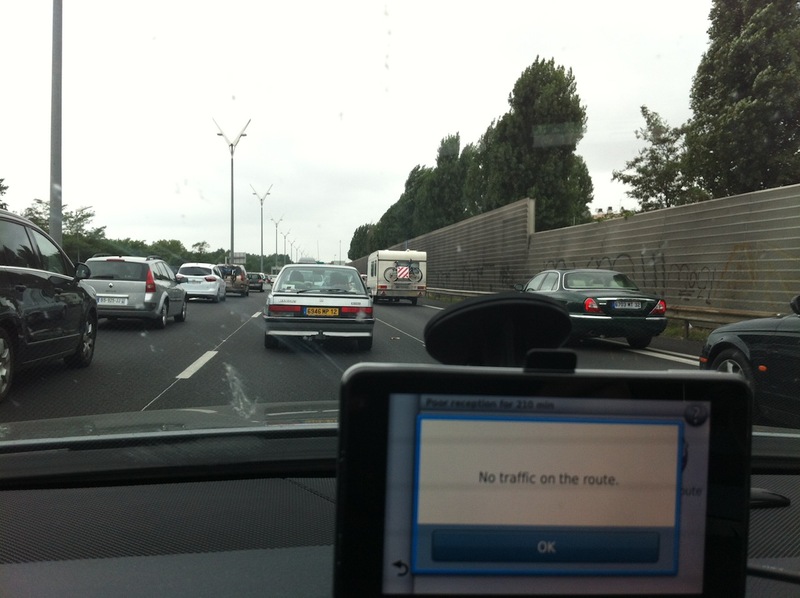 With roughly 4000 songs just a finger-click away its easy to let ‘die kilometers vlieg verby, with a wicked wicked back-beat’; that is if the traffic conditions allow you. I have also learnt that one of the best reference books on Europe, its history, cultural differences and happenings must be Goschiny and Uderzo’s Asterix and Obelix series. Each and every car owner north of the Pyrenees is heading down south to the beaches of southern France and Spain, as was the case when Asterix and Obelix went to help Huevos y Baçon and Pepe against that rip-off maestro Julius (why does this now have a South African ring to it? )and a 350km drive took us in excess of 6 hours with many occasions the highway coming to a complete standstill. At Bordeaux I decided enough is enough; I have a GPS and ventured onto those scenic small little roads closer to the coast. I don’t know whether its actually faster, but at least we moved and we saw some pretty awesome scenery. Spain is not at all a single country. The different regions all have their own and very strong identities and this adds to some serious confusion when visiting them. I mutht thtill figure out when to uthe ‘th’ for the etheth ath in Barthelona, Than Thebathtian, Thergio Ramoth and whether to thank thome-one with a grathias or gracias. Furthermore, I have learnt that ‘ll’ is pronounced ‘jj’ as in David Villa is actually Dahveed Veejja and Seville is pronounced Sêwiejja (take note Chris de Burgh, you’re not saying it right). ‘Actually’ is always pronounced actually and never ever actuajjy, though. But I’m dwejjing, I mean dwelling, so let me get back to our first destination, a rural retreat in the mountains of the Basque area, where Basque is spoken and not Spanish, and foreigners apparently not often seen, as the shepherd remarked when we had to wait for him on a tiny little mountain back-road to herd his flock of sheep past us, ‘we don’t often see English people around here’, in pretty OK English, I must admit. We were so in awe with the scenery that we completely forgot to take a picture of us being surrounded by sheep. 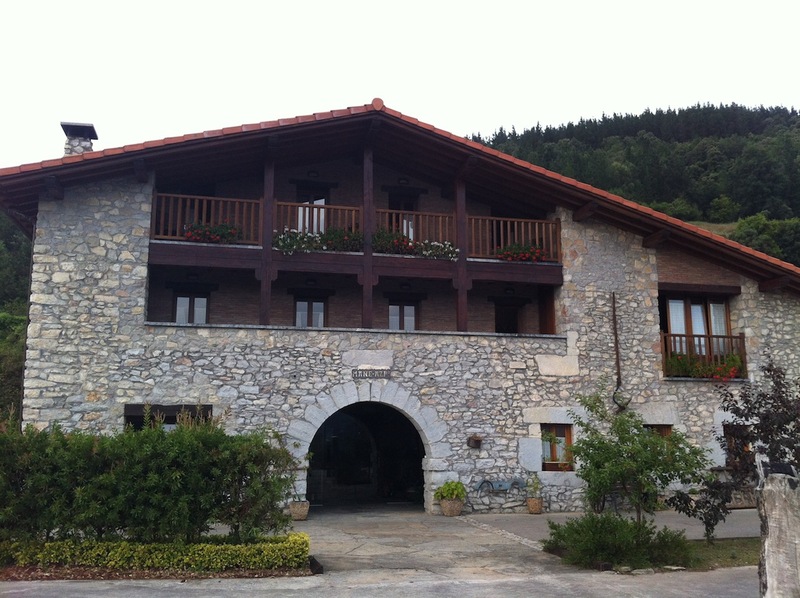 Hotel Rural Mañe proved to be a stunning little Basque country hotel where part of the farmhouse is converted into a beautiful little inn, complete with home cooking and La Rioja wine for dinner. And to cake it all, from the premises they also run a commercial bakery, which means breakfasts too are a delight with various pastries, salamis and jamons for the taking. Furthermore, the friendly and easygoing manager Naiara with their one-year old daughter on the hip and her husband Miguel running in assistance complements the true homely atmosphere and we thoroughly enjoyed our two-day stay. Basque is said to be the oldest language in Europe, not from Latin origin and thus totally different from anything else spoken in Spain. This was very evident even on the road-signs where plenty of ‘x’s’ occurs in the place names, which sometimes even provided some Xhosa feel to the names, though ‘only in my mind.’ The Basque country is an autonomous community within Spain and many towns are indicated by their Basque names on the information signs. 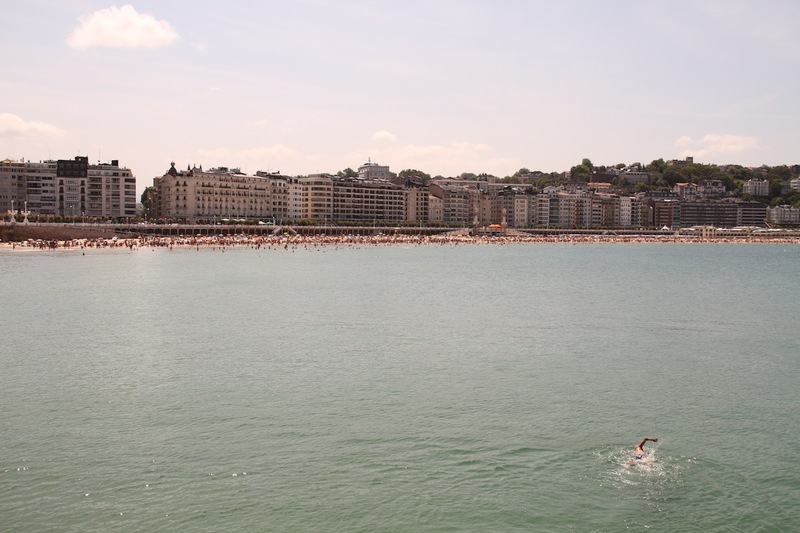 The city San Sebastian for example is known as Donostia, which is important to know if you thought you were searching for San Sebastian on the roadside directions. Neighboring the Basque country are the kingdoms of Aragón, Navarre and La Rioja, and in all my travels this was the most pristine example of the medieval kingdoms I have yet seen. Driving through the countryside and observing the castles, houses, monasteries and towns, I could imagine that the movie ‘Ladyhawk’ was taken straight from this scenery. Visiting the exceptional medieval town Olite (pronounced Olite) and its castle with the view across open land towards Ujue (pronounced Ogoeje) in the north, it’s very easy to lose yourself back into the days of King Carlos III aka ‘The Noble’ in the early 15th century who went for broke and built the magnificent castle, with its hanging garden, exotic trees, elegant galleries, and towers. Incidentally, Navarre, Aragón and Basque are the only parts of Spain that was never ruled by the Moors from North Africa. Here they did not ‘just swallow their pride but they fought back’ and retained their own land. They say you should not live in the past, and thus, just to keep the balance we also stopped by at Durban and enjoyed a calamari lunch. Durban is the restaurant of Javi Martínez, the Spanish international footballer now playing for Bayern Munich (formerly from Athletic Club Bilbao) in the town Ayegui (I don’t know how to pronounce it) who opened the restaurant after the 2010 Soccer World cup and named it ‘Durban’ in honor of his ‘pleasant experience’ there. Durban (KZN) is a nice town if I may say so, I grew up in Durbs, plus this is where Spain beat Germany 1:0 in the semi-final through a Puyol header in the 73rd minute in 2010. I suppose Durban makes more sense in Navarre than Moses Mabhida. And then you stumble onto and into these gems of destinations that are probably deliberately kept secret for the exclusive use by the locals, such as Donostia (San Sebastian) and its festival. Our idea was to stop, look around, have a light lunch and venture further down the coast towards the west. One look at the down-town old part of the city made us look for accommodation immediately, and I saw that if you stand back and leave some things to your kids, their natural initiative simply comes to the fore. Stean saw the little inn, and with Cara’s Spanish skills the two of them secured a four bed single room in the middle of the old-town hub of San Sebastian. I was initially worried that we will not be able to change our minds in the room, so small was it, but eventually we managed. We unintentionally stumbled straight into the heart of the town and it was the week when they have the town festival, probably the best week in the year to be in San Sebastian. 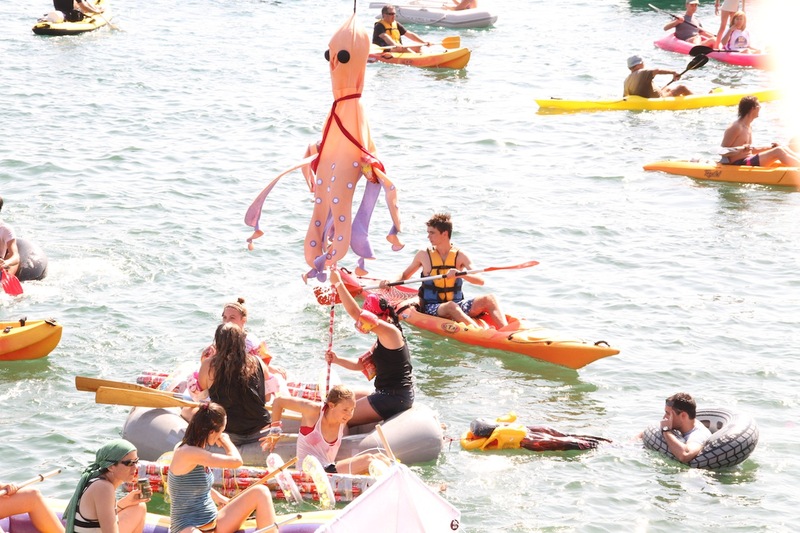 That afternoon, as part of the town festival, it was the annual float race in the harbor and bay of the town. 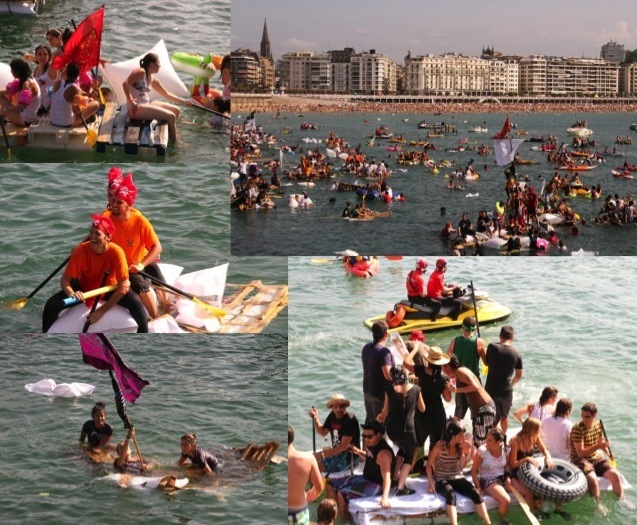 The young people of the town build their own floats with crates, planks, blown-up pillow type thingies and similar megafters, then enter the water and try to stay afloat while drinking, rowing and trying to tip the vessel next to you; one mega big town jol! Back to our accommodation! They say ‘location, location, location’ are the key indicators when considering accommodation, and this we did. However, we did get a little more than we bargained for. We were the proverbial 5 minutes’ walk from everything important when on vacation; the beaches, the restaurants, the shops, the Spanish ROCK SHOW, (which continued until 01:30), the street parties (that never stopped) as well as the municipal city cleaning services and deliveries who start their days just after 04:00 in the mornings. ‘Location, location, location’ clearly does not have anything in common with ‘sleep, sleep, sleep’! And that was not the end of our surprise for the day. When we went to get the car from the parkade, there was this little note at the ‘casse’ stating that ‘due to the festival and a cycle race, the parkade was closed until 19:00! We were locked in and (un)fortunately had to spend another day in the festive streets of Donostia! 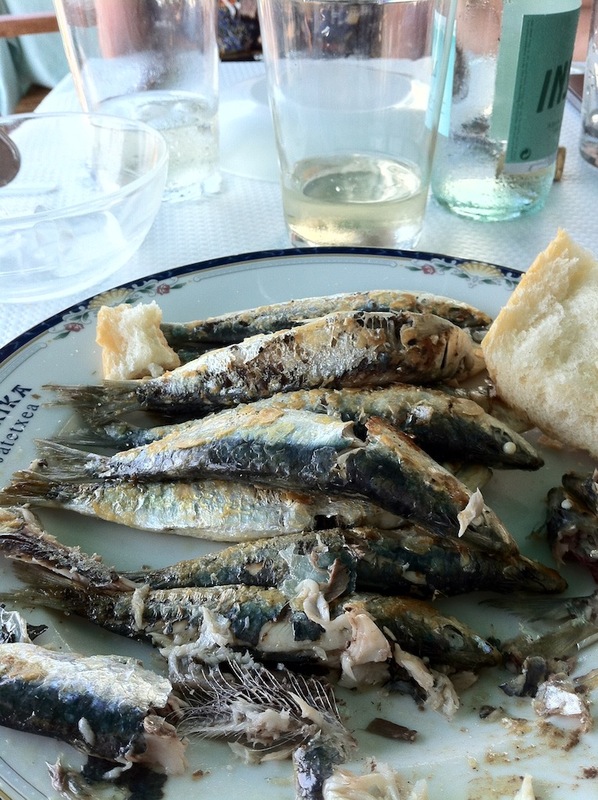 More time utilized on sun, beach, sea-kayaking, whale hunting museum and a typical Basque lunch with ‘sardinas’, paella, fish and wine. 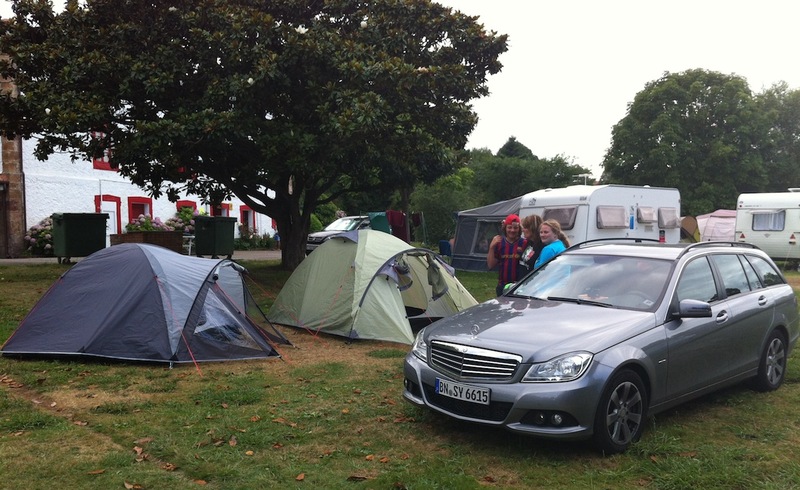 We unpacked our tents, inflated the mattresses and went camping! Such is the beauty of this part of the world, that if you don’t force yourself to stay in the car and drive, you will not progress more than, say 43km per day. 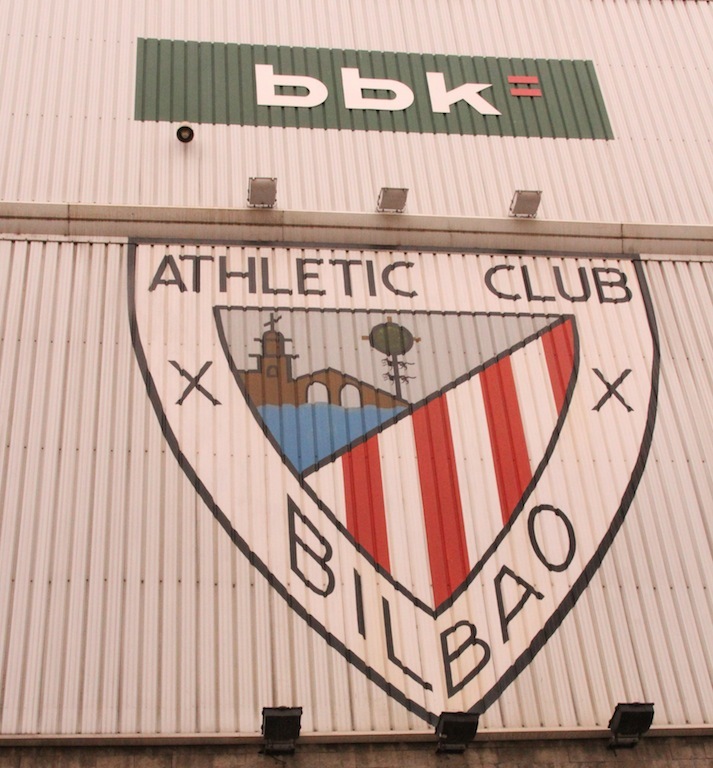 We did stop over in Bilbao to fit a Bilbao Athletic stadium tour into our schedule (its clear how football has become part of our travel criteria). Did you know that to this day the Bilbao club is Athletic (English, since it was the English dock yard workers who established the football club in 1898 and which became Athletic Bilbao in 1903) and not Atletico as is the other similarly name clubs and that Athletic Bilbao still holds the record of beating Barcelona 12:1 (1931). Athletic Club Bilbao still maintains the rule of only playing Basques in their team. What fascinates me is how this part of Spain is not Spanish at all and when reading and digging deeper, the most interesting political tales comes to the fore. It was noticeable that it was not the Spanish flag flying outside buildings, except for official government institutions, but the Basque ‘national’ flag. Even to this day the separate identities continue to strive and one should not make the mistake to think a Basque or Catalan is a Spaniard. One of the most despicable acts of modern warfare was the bombing of Gernika in the Basque country. On 26 April 1937 German and Italian fighter planes bombed the town of Gernika in a three-hour raid on the town. According to our travel handbook, the Footprint Travel Guide on Northern Spain, it was the market day, which means so many extra people from the surrounding countryside were in the town. And not only were the bombs dropped, but for maximum effect, the fleeing people were machine gunned down. To put this into perspective, remember that this was 1937; it was the Spanish civil war and not yet World War II. General Franco, the leader of the Nationalist forces denied that the bombing ever occurred and claimed that the damage was caused by Basque propagandists. The Basques resisted the advance of Franco’s nationalist forces and Franco offered the Luftwaffe the proving ground of their troops for the war that was to come. Herman Göring, at the Nurmburg Trials had this to say, “I urged him [Adolf Hitler] to give support [to Franco] under all circumstances, firstly, in order to prevent the further spread of communism in that theater and, secondly, to test my young Luftwaffe at this opportunity in this or that technical respect.” Though Germany did officially apologise in 1999 (yes, that’s 62 years after the event), Spain has not said another word about the incident. Pablo Picasso produced a painting by the name Gernika after the incident to commemorate it. 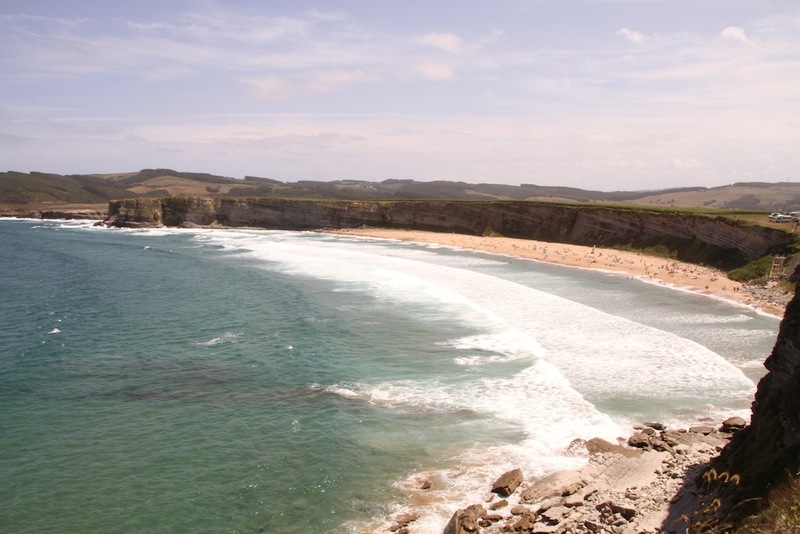 Venturing further west through Cantabria and into Asturias brings even more stunning and rugged coastline with plenty of old-pretty-fishing-town after old-pretty-fishing-town scattering the coastline. The flexibility of two three-man tents and inflatable mattresses we now used for accommodation enabled us to change plans and venues on short notice and it proved to be the perfect travel solution for scenic destinations such as Northern Spain. You see a town, you like a town and you find the camping spot, as easy as that. We ended up for a two night stay in Comilla and then two nights in a ‘nature’s valley’ like Playa de España some 10km out of Gijon resulting in four days of a blissful summer, sun, beach type holiday, reminding of my summer holidays at Scottburgh on the Natal South Coast in years gone by. Both me and my teenage son will obviously profoundly protest and deny any hint whatsoever that we particularly enjoyed the beach holiday that little bit extra due to the very tasteful beach attire of the Spanish girls. It was purely because we are so starved of proper sun and surf after two consecutive winters and 11 months living in northern Europe and not the Spanish beachwear (or lack there-of). but rather pedestrians roaming the streets scanning little restaurants, their Asturian paella and stews (which for some bizarre reason I missed out on), jamon iberica, sardines and other seafood delicacies. The looks on the kids’ faces were not always that impressed when a huge pan with crab and other seawater kreepy crawlies landed on our table amongst the huge quantities of rice to complete the paella. 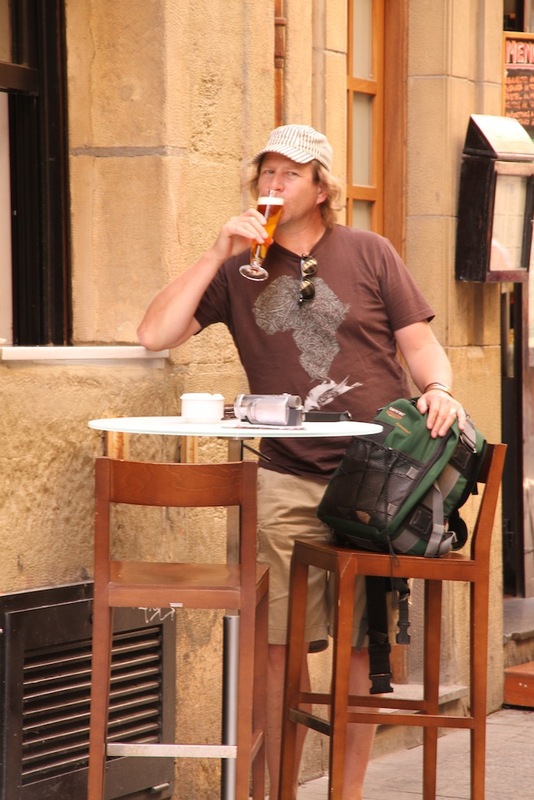 Interestingly in the Asturias is that the main drink is cidre and not beer or wine. It has its own ceremony when ordered. Asturian cidre is ordered by the bottle and then decantered in a very specific semi show-off way, to the uninformed onlooker, that is. 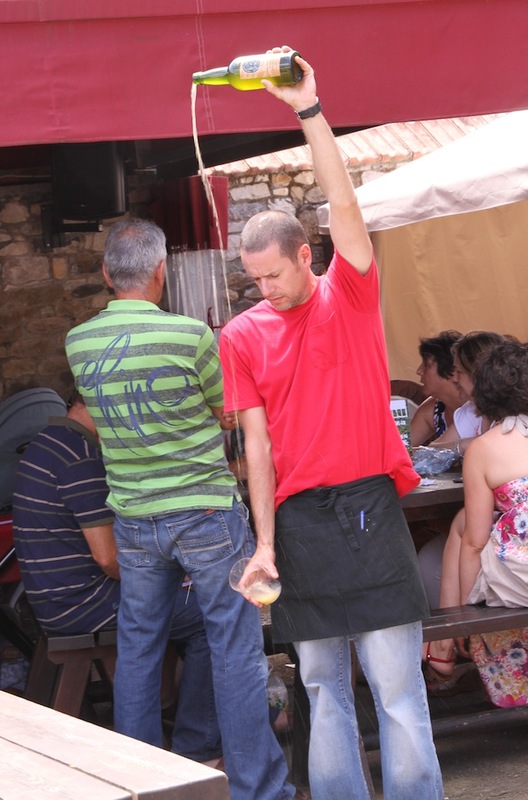 The waiter lifts the green bottle as high as possible with the one hand and then pours into the glass held as low as possible in the other hand, without looking at the glass. They do spill, and you have to mind your feet not to get them covered in cidre, but that’s just part of the ritual. The idea is that the height of the drop must create bubbles, which are an essential part of the drinking process. The drinker has a short little window of opportunity where the bubbles remain in the glass, and it must be drunk within this period. As Chris de Burgh so eloquently describes in The Storyman when he sings ‘take me back to the places I’ve never seen’I can also plea to be taken back to northern Spain as I have missed so much in Cantabria, Asturas, Navarre, Aragon, La Rioja and Basque. A week is far too short. 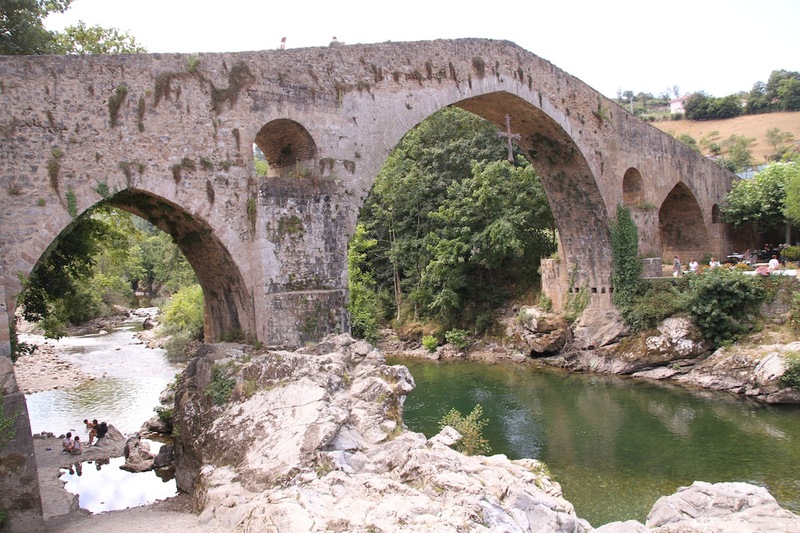 We did, for example drive through the Cantabrian Picos (picos de Europa), but it is one of those destinations where you should have the time to venture off-road, up the mountains and into the valleys. Though its in the middle if modern day Spain, there are still Cantabrian brown bears and wolves roaming the remote peaks. 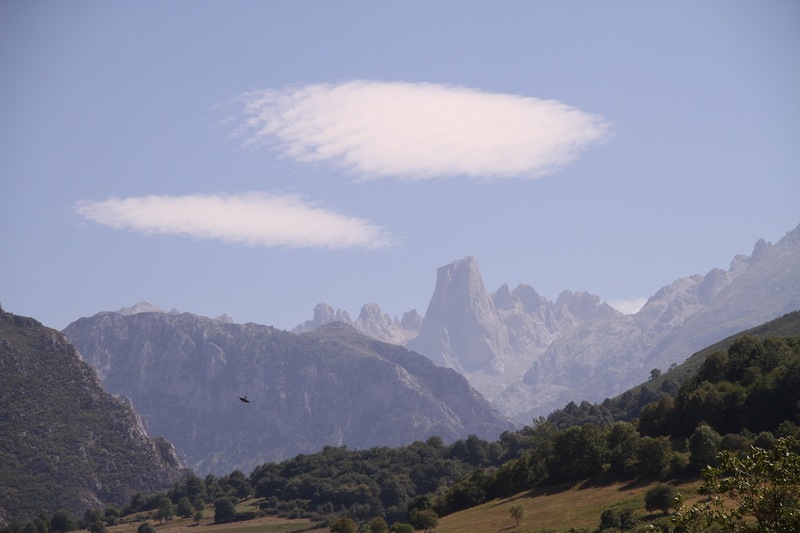 The Picos de Europa is a magnificent mountain range roughly 20km inland and apparently derives its name from the fact that it was the first sight of Europe for those early day sailors returning from their pleasure cruises in the Caribbean or around Africa. Once through the Picos, we headed east to Zaragosa as a sleepover before hitting the sights, sounds, sun and soccer of Barcelona. But that’s another story. Next Next post: Viva España! 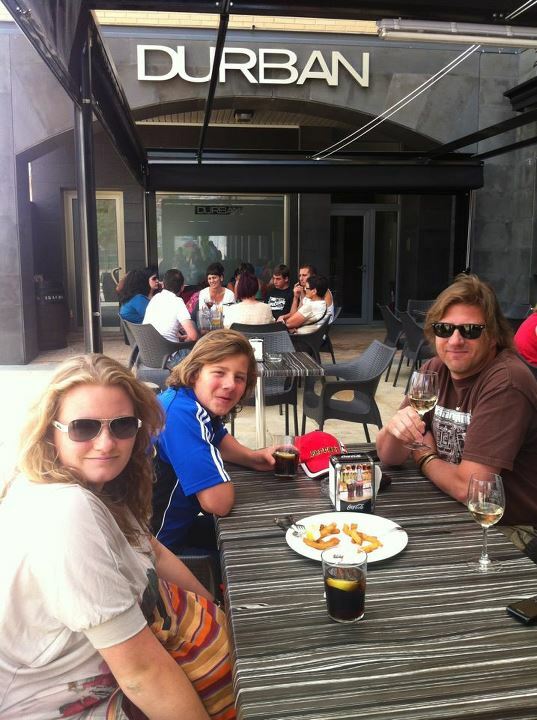 (2) But this STILL is not España?